Retails, sharing a long term valuable partnership as a Store Solution Provider with Samsung,is preferably assigned with responsibilities to refurbish its in-store surrounding for a unique and compelling brand experience. Apart from execution of several eye-catching POSM units for Samsung, we routinely do change over of Prints with new installation and configuration as per their Planogram specifications at a specified time. Most of the time, these prints change over take place when a specific campaign is rolled out either for new products launch or branding or both. 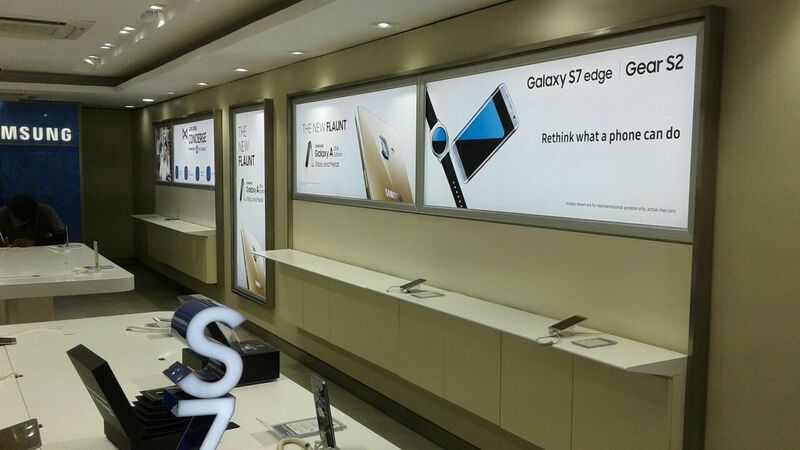 A little while back, we did Samsung print change over across its 54 stores in north India. All in-store translite prints were transformed into Aluminium back-lit Led Box with Fabric Prints. These wall hung fabric prints are aesthetic in look and meant for a lively brand communication experience and a result of any such transformation the appearance is quite evident. Here, we take this opportunity to introduce you with our award winning Fabric printing service that caters to each and every need of a brand in any format and gives an effortlessly chic feel to the viewers. Being armed with state of the art facilities, we are able to execute a project of any scale on Pan India level as well as abroad. We are already trusted and accepted by leading global brands, e.g. – Apple iPhone, Marks & Spencer, Fitbit etc. Available in a wide range of frame sizes & finishes- Aluminium, Wood etc. Do you feel that our service suits your brand’s requirement and it needs a prior testing? Give us an opportunity to submit our sample. Just get in touch through call, email or social media, we are always committed to serve you the best.